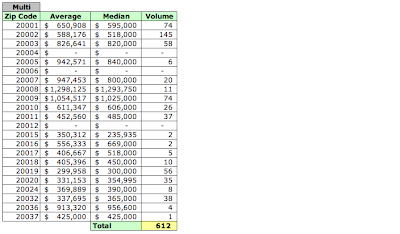 While knowing 2006's aggregate pricing and volume data for the District is helpful in understanding trends [see my previous post], I suspect many folks want information at a more granular level of detail. So here's the same data, this time organized by housing category by zip code. 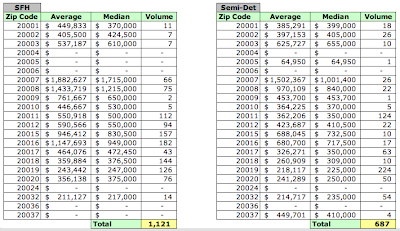 Almost 9000 residential sales were recorded by the District in 2006 [see figure on the right]. 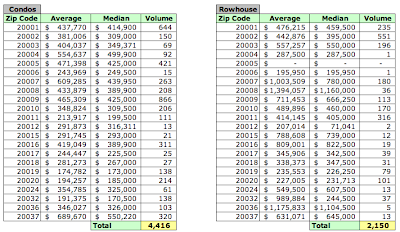 Three zip codes - 20001, 20002, 200009 - accounted for one third [32.46%] of all sales in the District. Condos constituted the largest portion of sales in zip codes 20001 and 20009, 65.58% and 82% respectively, while rowhouses had a 62.68% share in 20002. Perhaps not too surprisingly, the zip codes with the highest average sales prices were 20007, 20008, and 20015, with 20016 and 20037 following close behind. Condos represented almost half of sales in 20007 [47.39%] and 20008 [59%], whereas single family homes were the market winner in 20015 [77.72%]. 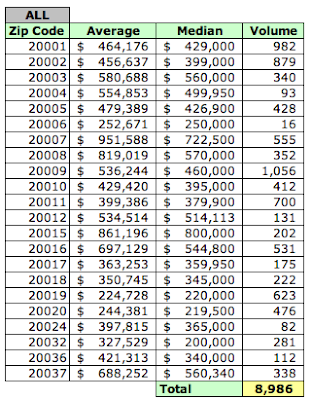 As discussed yesterday, and demonstrated consistently throughout 2005 and 2006, condos were almost half of all sales recorded in 2006, 49.14%. In 2006, rowhouses had a respectable showing, coming in second with 23.93% of sales, with zip codes 20008, 20036, and 20007 having the highest average sales prices.